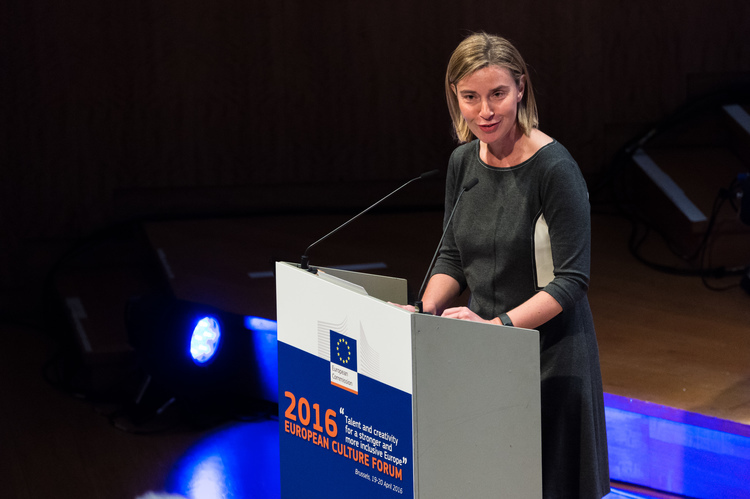 Federica Mogherini at the European Culture Forum 2016. Photo via European External Action Service. For more than a decade, ECF has been advocating to put culture at the heart of the EU’s strategy for international external relations. Together with our partners, we carried out research and co-founded More Europe – a coalition of stakeholders to provide studies, vision and guidelines for an EU strategy for international cultural relations. We have achieved that culture has been integrated into the EU’s external relations: on 23 May 2017, the Council of the European Union adopted Conclusions on an EU strategic approach to international cultural relations, underlining that the strategic approach should be “bottom-up and should respect the independence of the cultural sector”. ECF engaged from the outset with the EU’s former Wider Europe Task Force that led to EU policies and strategies towards its eastern and southern neighbourhood. Bringing cultural knowledge and experiences from these regions into European policy arenas, ECF helped securing a cultural dimension in these policies. ECF is an active contributor to the Eastern Partnership Civil Society Forum, and part of on-going discussions on cultural cooperation strategies. By merging our advocacy expertise with local lobbying initiatives in Eastern Europe and South Mediterranean, we help build capacities to push for structural change. We facilitate mobility and exchange and make the independent voices from these regions heard at the EU policy stage. In 2011, we joined the advocacy initiative More Europe – External Cultural Relations. This action helps to keep the doors of dialogue open between the cultural sector and the European institutions, pressing for culture to be made a competency within the European External Action Service. In Amsterdam, in September 2012, we brought together high-level Dutch and EU policy-makers, diplomats and international artists to discuss the added value of culture and creative industries in the EU’s external relations. Since 2012 we have been part of a European consortium mandated by the European Commission to conduct a Preparatory Action on Culture in EU External Relations. As part of a consortium led by the Goethe-Institute, we are taking part in a worldwide consultation and mapping of culture in the EU’s external relations. In May 2013 we co-initiated the international expert conference The Dwarfing of Europe? A Dialogue between Brazil, India and China. All these actions ended up in in the long-awaited achievement in 2016: the launch of the Joint Communication: Towards an EU strategy for international cultural relations – encouraging cultural cooperation between the EU and its partner countries. To help the EU implement this strategy and create synergies among all EU stakeholders, a Cultural Diplomacy Platform was set up . Funded by the European Commission and operated by a consortium, ECF as one of the partners, the Platform will deliver policy advice, facilitate networking, carry out activities with cultural stakeholders and develop training programmes for cultural leadership. ECF is one of the partners in shaping the Global Cultural Leadership Programme. This training programme specifically aims to improve the skills of cultural managers, enhance collaborative peer-to-peer learning, network building and enabling to develop fresh insights into international cultural collaboration practices. ECF Director Katherine Watson and Tibor Navracsics, EU commissioner for Education, Culture, Youth and Sport. Photo by Xander Remkes. Engaging the World: Towards Global Cultural Citizenship and country reports, all available in different languages and formats to download on the Preparatory Action website. Creating Art and Enabling Access for All - a report from Tibor Navracsics’s visit to ECF (November 2015).